Who is Trevor “Douglas” Moore? So let me address the obvious answer here…YES, it is me, but that is not the point of the question. The question is more of an internal reflection on who I am versus what it is I do for a living. All too often we identify ourselves by what we do rather than who we are. When we start to tie who we are and what we do together too tightly, we lose our sense of self in the process. We begin to forget what is truly important to us, what gets us fired up and out of bed in the morning, what scares us to death and the real reasons we “rise-n-grind” each and every day. Over time, the game plan changes right under your nose. When I am doing something I enjoy for a living, it is natural for me to have a little of myself in everything I do…in fact it is important when dealing with a personal brand like mine. The problem is, if I am not careful, over time, I begin to slowly identify myself more with what I do and achieve than who I am. My wife and I use a strategy in our home, where we refer to ourselves by our name – Trevor Moore, for example – when we are describing the conscious version of ourselves. The version we and the outside world typically associate with what it is we do for a living. The shell of our existence so to speak. When we are trying to get in touch with our inner substance, and acknowledge the voice for our subconscious, we use our full name – Trevor Douglas Moore – to identify our true passions, fears and deeply rooted habitual thinking. These are the places where the seeds of personal growth lay dormant if not tended to. These seeds need sunlight to grow just like all the others. 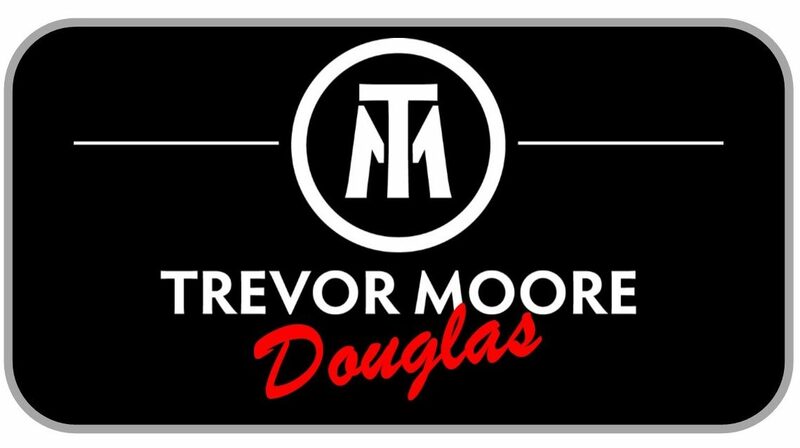 Who is TREVOR DOUGLAS MOORE? I am an outdoorsy kind of guy, who believes humans are solar powered and should be appreciating nature’s beauty to its fullest each and every day. Unless of course it is overly hot out…then by all means, one should appreciate air-conditioning and Modern Family re-runs. I am a chronic pain survivor and mental health advocate, who works hard at trying to slow down his thoughts and speed up his body…remember, I said trying; the struggle is real sometimes. I am a passionate family man, who is happily married to the love of my life, my best friend, loudest cheerleader and most patient women on earth…next to my own mother of course. I am blessed with three wonderful children, all of which are every bit as human as everyone else. None of them are “perfect” however they are all happy, healthy and persistent, much to the chagrin of my wife and I sometimes. Parents, you can all relate right? I am allergic to dogs, yet a proud dog “Grandpa” to the coolest living thing to happen to our home since the birth of our children. Jax is worth every second of the runny nose, itchy eyes, sensitive skin and holes in the back yard. I am a believer in full-body health and wellness, which is why I am sometimes vegan, sometimes vegetarian….but always hungry. Diet is one of the many tools I use to manage my mental and physical health. I only mean “tools” in the metaphorical sense…because real tools and I don’t get along. I am a Horble Spelr who is blessed to live in the modern era of spell check and autocompact….sorry astroreflect…arrggh…computers! You feel my pain write? I am just like everyone else riding around on this amusement park ride referred to as life on earth. I never feel like my wife is a passenger with me though…she is more like the carnival worker yelling “DO YOU WANNA GO FASTERRRRRR!?!?!?!?!?!? Which is why we are such a great team…we compliment one-another in so many ways. I am learning to stretch and grow while dealing with the growing pains associated with it all. I am learning to be comfortable with discomfort…my teething grand-dog taught me, I can be lovable and happy while being uncomfortable. Consider writing out who you are, without describing your outer-shell and/or daily work actions and achievements. Remember, you are not your job description, title or credentials. Trust me…it is a powerful reminder of who you truly are. Defining ones self is never an easy task. Labels too often are broad spectrums of what society decided. You have done an excellent job of cultivating a difference of who you are and what you do. I accept the challenge of figuring this out for myself as well. This will be my March goal, perfect timing for a new season in life. Spring is always the best time to plant new seeds!